Embark on an exciting, educational and profitable journey of Flavour Discovery with Zenan. Professor of Beer Thirst For Knowledge Inc.
Roger Mittag, currently a Professor at Humber College, is also the founder of Canada’s leading beer education company, Thirst For Knowledge. He has been bringing his beer appreciation tips to Canadians since 1997 through a series of tasting seminars, beer dinners and educational events. 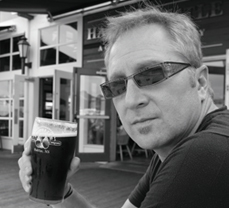 He is a consultant to several Canadian breweries bringing his extensive beer industry knowledge and enthusiastic approach to their sales and marketing teams. He has created Prud’homme Beer Certification, a sommeliers-style program for beer and the first such program in Canada. Roger also owns and operates The Beer School, which offers beer courses to consumers. He has recently co-authored a beer and barbeque book with Chef Ted Reader, titled – ‘Beerlicious: The Art of Grillin’ and Chillin’. Rediscover beer and all it has to offer. Centuries old, beer is enjoying resurgence in popularity today. Beer lovers everywhere are realizing that beer is as complex, delightful, aromatic and sensual as wine. Zenan, in partnership with Roger Mittag (founder of Thirst For Knowledge) Canada’s leading beer educator, is leading a wave of change unlike any you have ever experienced before by turning beer on its head and redefining how you view your beer and how your beer is appreciated by your customers. Zenan will MAXIMIZE your beer experience with the ideal glass for your unique product. Are all beers created equally? Are you placing your own unique stamp on your beer? Why choose a generic pilsner or lager glass, when you can choose the perfect one that brings out the very best in your beer. Awaken your customer’s sense and taste buds by choosing a glass that accentuates the characteristics created by your Brew Master. By selecting the ideal shape glass, your customers will be able to appreciate the refreshing coriander and citrus of a wheat beer, or the warm hints of cinnamon and spice in winter ale. We invite you to view beer glasses in an entirely new way. Impact the overall beer experience through taste, aromatics, mouth feel and visual elements. Serve as a dynamic merchandising opportunity. International studies have shows that patrons will pay up to 30% more for a beer served in an appealing glass with a logo on it, versus a plain unbranded glass. A comprehensive needs assessment of your glassware business. A full review of your brand portfolio and current glassware models. A customized flavour map for each brand using The Zenan Flavour Discovery model. Recommendations of glassware styles to optimize the beer experience. Suggested pouring and serving measurements. A complete glassware handling guide for your customers. A customized Features and Benefits sheet for your sales team.